For my Wednesday Vignette I'm sharing a picture that I took at the recent Northwest Flower and Garden Show, of a flower in the display garden of the Northwest Orchid Society. They always put on a wonderful display. I admire orchids, even though I've failed miserably at growing them. The shape reminds me of the one hardy lady's slipper that I grow in my garden. Good Morning, Alison! The orchid garden was beautiful, and they had some rare varieties there. I do agree that this bloom looks like a lady's slipper's flower! Lovely! Interesting flowers, boring foliage. Like you, I'm skilled at killing orchids so admire them elsewhere. The Orchid Society really did a super job again this year with their display. It's a gorgeous thing! I've heard that slipper orchids can be difficult. Cymbidiums are easiest here but then we're MUCH warmer on average (over 80F today!). I love the slipper orchids. 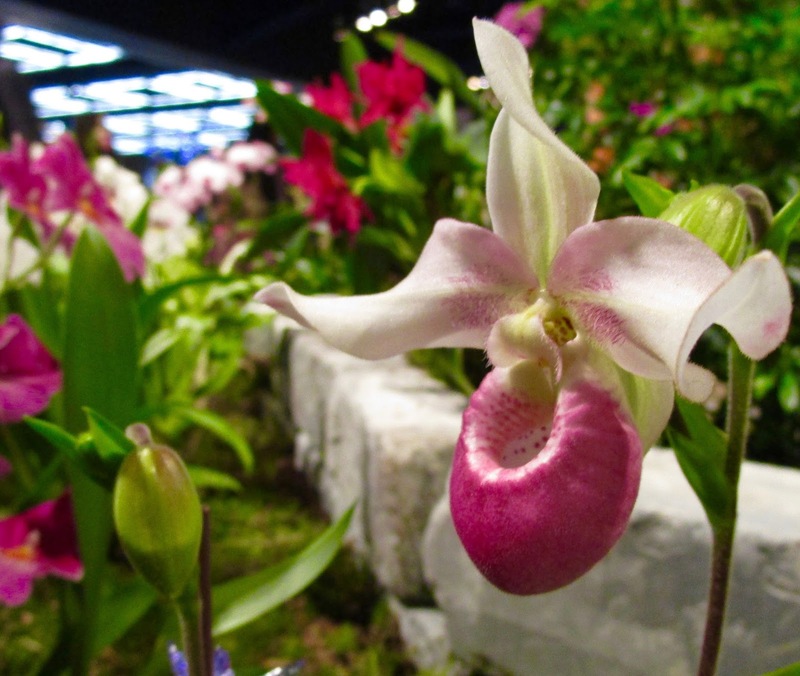 The Orchid display is one of my favorite parts of the NWFGS. I can spend a lot of time there. The flowers are so marvelously intricate! That's a beautiful flower and the colorful background adds to the scene. I'm good at growing Orchids for years and years and years without them ever blooming. We all have our Orchid war stories, I guess.